There are the kind of albums that you need to listen to very attentively and more than once to reveal their inner secrets. 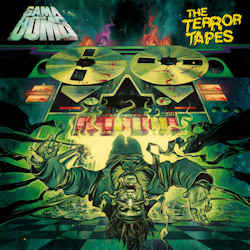 And then there are those of bands like Gama Bomb who make it very easy for the reviewer. It seems as if time has stopped in the mid- to late-Eighties for this quintet from Northern Ireland. They play this kind of dirty thrash infused speed metal with a healthy dose of crossover humour that was really big back then. In their case, I have to think heavily of Nuclear Assault, from the songwriting to the instrumentation, and everything in between. Gama Bomb have overall less serious lyrics, but in the past they showed already occasionally that they can have insightful moments when they spewed their anger against racism and fascism, something which today is unfortunately very unpopular with contemporary metal bands that prefer to stay “unpolitical” because it is bad for business to alienate even the most obnoxious possible fan bases. Gama Bomb were founded in the beginning of the millennium, and The Terror Tapes is already their fourth longplayer, and their first one on their new label. With thirty-six minutes, this is a rather short affair, but in the band’s history, it is strangely enough one of their longer works. The twelve songs range between eighteen seconds and four and a half minutes, and while their mini-song Shitting Yourself To Live doesn’t achieve the same kind of fun as those of Nuclear Assault and S.O.D. (who were right wing nuts but still wrote some great music on their debut), their regular songs certainly don’t have to hide behind the artists that influenced them. So most of the lyrics are really silly, with lots of nods to Eighties icons like Robocop and Willem Dafoe, but wasn’t that a nice and innocent time when metalheads were not ashamed of having a good laugh instead of always looking grim and evil while praising Satan? The Terror Tapes is probably no different from the band’s three preceding albums, but then no one would have expected them to change their winsome formula. 1986 may lie a long way back in the past, but everyone who was already alive and thinking back then should get a really great time out of Gama Bomb. And all those youngsters who commonly mistake metalcore for metal, should also check out this history lesson to finally understand what real metal used to be about, and then be ashamed that they lived in ignorance for such a long time.